I did it again–we were invited to a holiday party last Saturday night and I spent all day Friday and Saturday making an outfit to wear (this blouse with the black velvet jeans in the previous post). I guess I work better under pressure, but just once I’d like to have my outfit ready and hanging in the closet while I take a leisurely bath and get ready to go. Happily my outfit did turn out great and I’m sure I’ll wear it a few times this season. I saw a beautiful Tadashi blouse on Neiman Marcus.com and fiddled around with Vogue 7906 to get a similar look. I added another pleat to the shawl collar, sewed up the center front instead of using buttons, omitted the front darts and made tie ends that I sewed into the side seams. It was an easy alteration and if you’d like pictures and detailed instructions, just say so and I’ll add them to this post. My Bernina has been in the repair shop for 5 (!) weeks. After 3 weeks I was going into withdrawals and I purchased a used Pfaff for $30 from Craig’s List. It’s a nice, sturdy mechanical machine and it will be a great back-up when I get my Bernina back. Unfortunately, it’s an older model and sews a 4-step buttonhole. The buttonholes don’t turn out nearly as nice as my Bernina’s one step buttonholer. 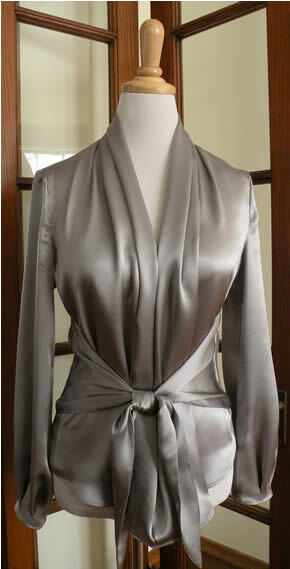 So, I’ve been avoiding buttonholes other than the odd buttonhole for a waist finish. 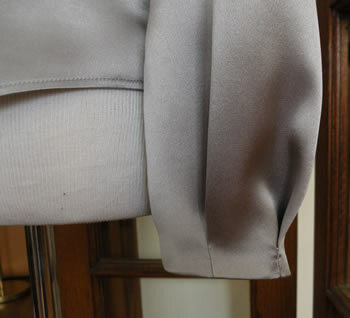 I didn’t want to put cuffs with buttonholes on my blouse so instead I used the sleeve from View B (flared at the bottom edge) and pleated the fullness in at the wrist. I finished the bottom with a facing. Your blouse is absolutely beautiful! Love the changes you made to the pattern! Thank you Erica! I admire what comes out of your sewing room too! Always so chic and creative. Goodness, that’s GORGEOUS! I love the color, the styling, etc. The perfect pairing with those fab pants! What a fabulous work! You did an excellent job on this knock off! Thank you for posting your creative chages to this blouse pattern. 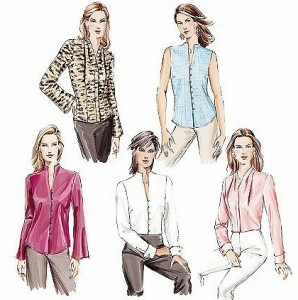 I currently have this blouse pattern awaiting cutout. With your great ideas I can get another blose out of the pattern. Thanks! hi do you sell any of your pieces. your really talented I would love to buy this blouse. any chance ? Do you still have the pictures and detailed instructions on this blouse? I’d really like to have them. 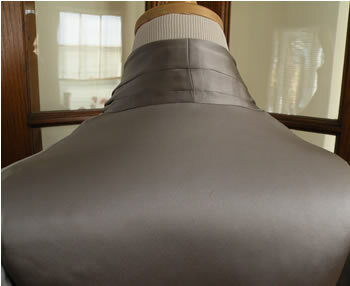 Very beautiful job on this blouse! no, but thanks for your interest! I hope you’ve had a chance to try this out!